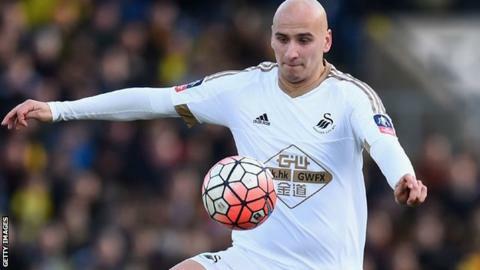 Jonjo Shelvey could have played an important part in Swansea City's fight to avoid relegation from the Premier League, according to John Hartson. England international Shelvey joined Newcastle from the Swans for £12m. Former Wales striker and Swansea fan Hartson said: "I feel he could have been excellent at Swansea. "He could have been somebody who could make a difference for their fight to stay in the Premier League because they're in a dogfight." Shelvey made an excellent start to the season, but had become a peripheral figure during the Swans' slide towards the relegation battle. Swansea are 17th in the Premier League, one point above the relegation places with 18 matches left to play. Hartson was unimpressed by Shelvey's performance in the 3-2 FA Cup defeat by Oxford United, a display he feels might have been symptomatic of a personality clash off the pitch. "On Sunday he wasn't 'at it' for me," said Hartson. "He never made a difference for me against a lower league side. I'm not blaming him for the defeat, but he wasn't roaring around the pitch making challenges. "I have to say that lad has got quality and it's not just worked out. Whether that's a personal relationship with Garry Monk and now Alan Curtis, I don't know." The former Arsenal and Celtic striker hopes Swansea will use the £7m profit from Shelvey's sale to bring in a new player quickly. "I'd imagine Alan Curtis will work on one out, one in - I'd like to think they have got someone in mind because they are losing a quality player," he added.